our spring meeting of the association is set for Saturday, may 4, 2019. Registration will begin at 8:30 am and the meeting will START at 9 am. This is our Business meeting and we will hear reports from various entities in the association such as our Association Minister, tREASURER, MODERATOR, Settegast Heights, United Campus Ministries. We will also have a report from the SCC and Slumber Falls Camp. OF special note is we will be rolling out the application for the first Bethel Legacy Grant. The day will also include a lunch and a worship service. THE LUNCH MENU AND COST, ALONG WITH THE rsvp ADDRESS WILL BE ANNOUNCED SHORTLY. Please note that according to the association bylaws each congregation may have 5 lay voting delegates in addition to ordained ministers holding standing in the association. In August 2018 Fort Bend Recovers hosted a county-wide commemoration of our Harvey recovery efforts. 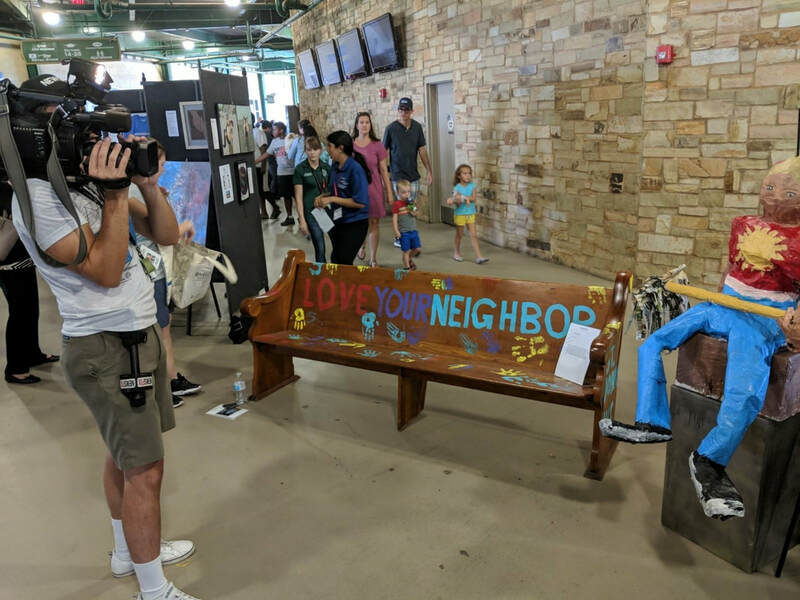 Part of the program at Constellation Field was an art exhibition. St. John’s United Church of Christ entered a pew. It's just an old pew. It was sitting in a classroom corner and wasn't in use anymore. But over the last year it has seen truckloads of pet supplies move into and out of its classroom. It has seen hundreds of hands at work in Harvey relief. A pew is not just for sitting but empowering the labor of our hands. In the wake of Hurricane Harvey we came together as a congregation. We collected cleanup and school supplies. We gutted homes, we helped restore two sister churches, we housed evacuees, we became a warehouse for pet supplies. We received blessings from around the country. We loved our neighbor as ourselves. That's what the Body of Christ is called to do. Even before Harvey hit, Kevin Murphy from Church World Service in Austin, called and said he is praying for us and all the people on the Gulf Coast. Right after the brunt of high winds, Rev. Ramona Lopez, our UCC Disaster Coordinator for Houston, checked in to receive our report and she offered prayer and support. What follows are two reflections by Darwin Enax and John Eixmann on how did and what to learn for next time. Our church had several members who were affected by Harvey. Some had major water damage and some had to be evacuated from their homes due to rising water. I kept track by text messaging or calling those affected for updates. This was a way for our church family to know how our members were doing. Our Family Ministry and Monday Morning Men’s group helped with cleanup of Christ UCC, in Cypress. Several of us members evacuated our Church secretary and moved her from her home into our church fellowship hall. Members opened their homes for other members and our secretary, and her neighbors stayed at our church for as long as needed. In addition, our church set up a pet supply drop off & distribution site. The site was managed by the church secretary and assisted by members. A Midland, Texas, group of six members of Rescuers Without Borders & MASA delivered supplies. The public could drop off or pick up supplies as needed. I wish I could include all the names of all the individual members who helped where and when needed. Many members supported with the giving of monetary gifts, gift cards, cleaning supplies and food. These are some of the memories and overwhelming response that brought together so many people. As we look on how we can learn from this catastrophic event, I’m not sure you’re really ever prepared. We could look at how we responded and know that when this type of event presents itself, our church members will be prepared to pitch in where needed. St. John’s United Church of Christ in Rosenberg, Texas was instrumental in helping its congregational members after the devastation of hurricane Harvey. Calls were made to those individuals that were previously flooded to determine if they were affected by this disaster. Men of the Church surveyed the Church buildings to determine what water damage had occurred. Men of the Church gathered to help clean out a flooded Church member’s garage in an attempt to salvage the structure and assist in restoring it to a usable condition. Through donations of cleaning supplies, boots, gift cards, etc., our Church was part of the relief effort in the community. All of the items donated were delivered to the Brazos River Flood Recovery MARC center which was located at BF Terry High School. Many pet supplies and food were gathered and delivered to those that could distribute them to others. The Church building was used to house individuals that were flooded or did not have access to their homes due to flooded roads that were closed. If there is a “next time”, the Church needs to set up a volunteer list that would accept calls at the Church from individuals to determine how they could be helped. We also need a list of individuals that should be contacted to determine if they are okay.